Tradeshows often have hundreds of companies exhibiting there, so how can you distinguish yourself from your competitors? By designing eye catching and effective marketing collaterals like banners, flyers or even trifold brochures like we designed for Horizon TMG, a training and management group based in British Columbia that specializes in tools and solutions to aid repair facility owners, managers and employees to better manage their businesses. Our designers needed to fit all the necessary information onto the trifold in a way that was appealing but also consistent with the company’s current branding and design of their intelligent dashboard, training and coaching software. Before starting on the creative process, our designers first spent time understanding the business and their software they were promoting at the trade show. With this research, they could design materials that were in line with the company’s branding. With brochures, the layout is crucial so our team spent time organizing all the important information and laying it out. 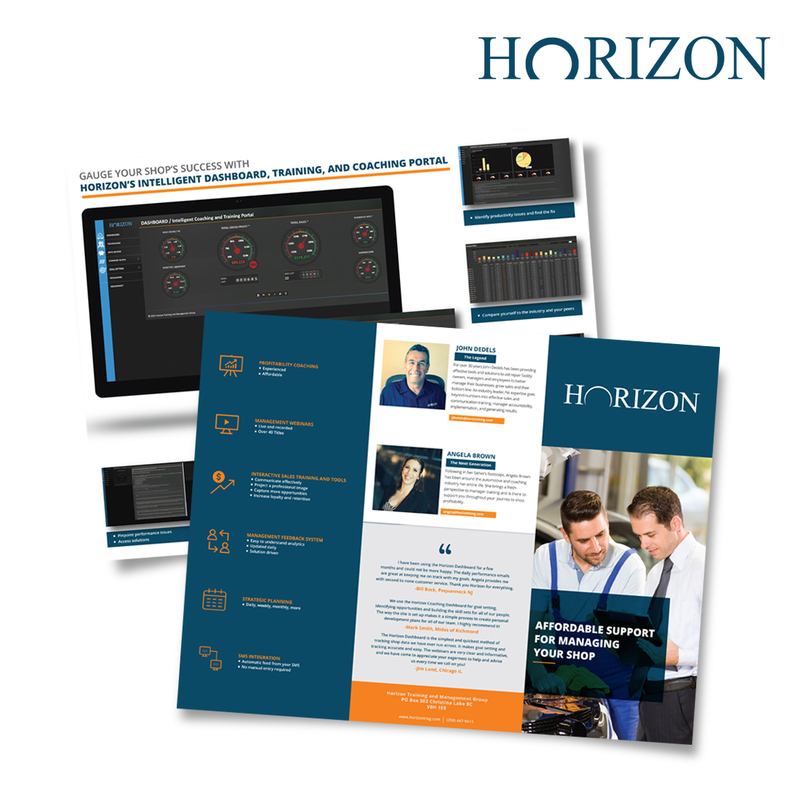 The trifold features the blue and orange, in both the text and icons throughout, to match with the colors of Horizon’s software. All elements were organized so that it’d be eye catching and easy to read to anyone who was passing by at the trade show. It was also crucial to establish credibility quickly so our designers put the two company leaders along with testimonies to build up Horizon’s experience and reputation in the industry. The client loved the final product; it looked professional, While a trifold may seem like not enough space to convey all the information you want to, our skilled designers are able to not only organize your information precisely but also lay it out in an eye catching way. Need trade show materials like flyers, banners, brochure or even table cloth design? Contact our experienced team today!